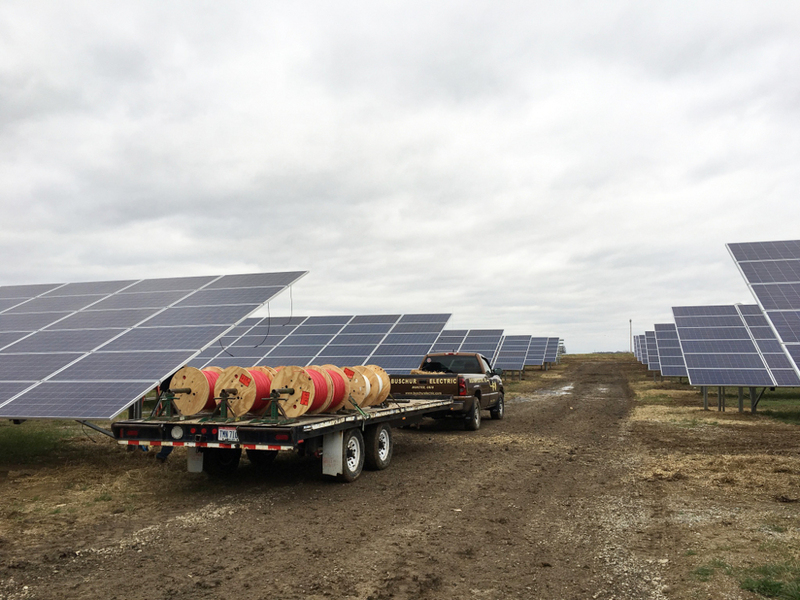 Crews work on a solar farm near Minster, Ohio. Solar industry jobs doubled in the Cleveland, Ohio area last year, driving about half of the state’s total job growth in the sector, according to new data released today by The Solar Foundation. However, the industry’s future growth in Cuyahoga County and elsewhere in the state could be jeopardized by ongoing uncertainty over Ohio’s renewable portfolio standards, said Andrea Luecke, president and executive director of the organization, based in Washington, D.C. The detailed data are a follow-up to a nationwide report released by the group last month. In addition to each state’s solar job totals, data posted by the organization at SolarStates.org include information about minority participation, breakdown of jobs within the industry, patents, per capita ranking and more. “Definitely Ohio is the heavyweight among its neighboring states,” Luecke said. According to the data, Ohio’s solar industry produced $1.3 billion in direct sales and employed 5,831 people in 2016 — a 21-percent jump in job numbers compared to 2015. In contrast, Michigan had about 4,000 solar jobs, and Indiana was just shy of 3,000, the data show. Solar job numbers for Cuyahoga County climbed to 1,043 last year, compared to 516 the year before. Within the county, plans are moving ahead for a 15,000-panel solar farm proposed for the site of a former landfill in Brooklyn, Ohio. And about 60 households will be installing rooftop solar panels as part of a solar co-op for the county, Foley noted. Growth in Ohio’s solar industry also has a multiplier effect, The Solar Foundation reported. In other words, wages earned by its workers spur growth in other sectors of the economy. “One solar-related job supports 1.31 jobs elsewhere in the Ohio economy, while every $1 spent on solar generates an additional $0.87 in spending throughout the state,” Luecke noted. The figures come from an analysis by George Mason University in Fairfax, Va., using an economic model known as IMPLAN. Ohio’s solar industry employment is also relatively diverse, the data show. Women hold almost 43 percent of the state’s solar jobs, which places Ohio fourth behind Vermont, Tennessee and New Mexico in that category. “Ethnic minorities make up 19 percent, which is above the national average as well,” Luecke observed. The national average wage of $26 per hour is comparable to that for coal mining in 2015. Yet even before the jump in jobs last year, Ohio’s solar industry provided more than twice as many jobs in the state as coal mining did. Data from the Energy Information Administration show that the state employed 2,309 people in surface and subsurface coal mining in 2015. And in contrast to Ohio’s 21-percent jump in solar jobs last year, the 2015 jobs number for coal mining was a 21-percent drop from the state’s 2014 employment in that sector, the EIA data show. Overall, the nation lost 12 percent of its coal mining jobs from 2014 to 2015. All may not be as rosy for the state’s solar industry in the future, however. Last fall First Solar announced plans to lay off 450 workers at its Perrysburg township plant. A large part of that facility will be retooled, and hopes are that it will open again in 2018. Additionally the Hamilton County area around Cincinnati had 540 jobs last year, down from 757 in 2015. On a national level, the White House held a background briefing last night on President Donald Trump’s executive order to roll back the Clean Power Plan and other environmental protections. That could dampen overall growth for the solar industry nationwide. And Ohio could grow even less than other states due to continuing uncertainty over the state’s renewable portfolio standards, Luecke said. Ohio’s renewable energy standards resumed this year after Gov. John Kasich vetoed a bill that would have basically extended a two-year freeze for at least two more years. Now House Bill 114 proposes to make the renewable standards into voluntary goals, with provisions that could weaken the state’s solar industry. “The standards obviously do matter, because states that have high standards are crushing it in terms of solar jobs,” Luecke said. “It has a lot to do with signaling to companies that there is permanence [and that] there’s stability,” she explained. “That’s very important to the small companies that are really struggling.” Those companies are less able to take risks in the face of uncertainty, she explained. Large companies are less likely to stay or locate if an atmosphere of uncertainty continues, especially when other states offer more promising markets, she added. “Solar companies are very dynamic, and they go where the market leads them,” Luecke said. The debate over Ohio’s renewable portfolio standards isn’t just about jobs, Foley stressed. Greenhouse gas emissions from fossil fuels contribute to climate change. In turn, climate change raises the risks for extreme weather events and is projected to have severe impacts on the economy, the environment, national security and human health. “We’ve got to change the dynamics of how electricity is generated,” Foley said.